Patios look darker, get filled with weeds and algae when they aren’t properly maintained. To have cleaned and properly maintained patios you should pressure wash them regularly. This is work which needs to be done by experienced and skilled cleaning technicians. Our company offers effective patio cleaning services which can be used in residential and commercial estates, located in Hendon NW4 during every weekday and weekend. Get in touch with our representatives to schedule the pressure washing of your patio. 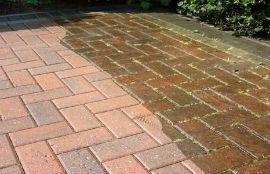 After pressure washing the patio in your property it will look refreshed and won’t be covered with algae, moss or mould. The weeds and pollutants will be removed and reveal perfectly clean slabs and pavements. We use effective jet washing machines which work with hot and cold water. The hot water kills the algae and effectively extracts all kinds of contaminants. The cleaning which we provide ensures effective removal of weeds, moss and algae and preventing their growth. Our cleaners spray with special detergents to protect the concrete, natural stone and other types of patios. 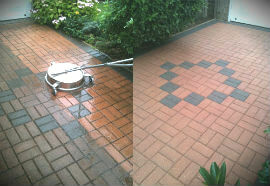 The patio cleaning which we offer is available in and near Hendon at affordable rates. If you need professional and effective cleaning of the patio in your home or commercial property, use our services. Our cleaning staff will inspect your property and assess it to prepare you a quotation. They use hot water to dissolve obstinate stains and dirt which can’t be removed with cold water. The washing with cold water which we provide is very effective as it is done under high pressure. To have perfectly sanitised and refreshed outdoor areas, use our patio cleaning services that we offer in Hendon NW4 at affordable prices.